Well, another school year is over! Today is the last day of school for my youngest…she is more than ready for it to be over since her sisters are already finished. My oldest came home from college for the summer the first week of May, and my middle daughter had her final exams last week. While they are on “summer mode,” Claire is still setting her alarm clock every night. I always have mixed emotions on this last day of school…happy to have a more relaxed schedule (love those carefree summer days) and see more of them, but also sad to see another year come to a close. These years of raising my girls are going by in a flash. Bittersweet, for sure! Well, enough with the emotional talk…time to talk muffins! 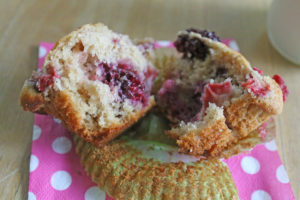 Now that summer is approaching, it is the perfect time to bake these triple berry muffins. 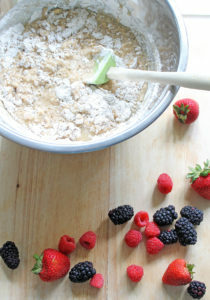 We have a little more time in the mornings to prepare breakfast since we aren’t rushing out the door to school AND all those berries are in season! A perfect time to try this recipe! 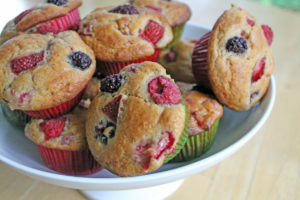 They combine strawberries, raspberries, and blackberries into a flavorful muffin! These make a great breakfast, an afternoon snack, or a sweet accompaniment to a salad. So while you’re printing the recipe for these yummy muffins, I’ll be packing away the backpack and lunch box until school starts again! Preheat oven to 425 degrees. 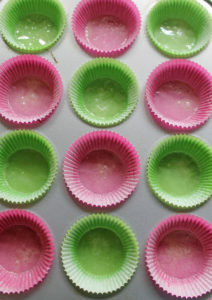 Place liners in muffin pan and spray with non-stick spray. Set aside. In a large bowl, combine the flour, baking powder, salt, and cinnamon. Mix until all ingredients are combined. Set aside. In a medium bowl, whisk together the eggs, sugar, and brown sugar until combined. Whisk in the milk, oil, and vanilla extract. Fold the wet ingredients into the dry ingredients, and mix everything together with a wooden spoon. Avoid over-mixing. 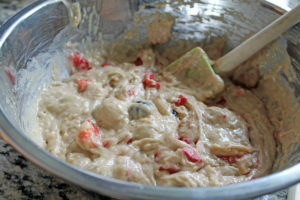 Gently mix until all the flour is off the bottom of the bowl and no pockets of flour remain. The batter will be thick and somewhat lumpy. 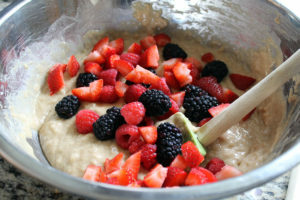 To avoid them from leaking their color, very gently fold in 1 3/4 cups of the berries. Spoon the batter into the prepared muffin tin. Fill them all the way to the top. 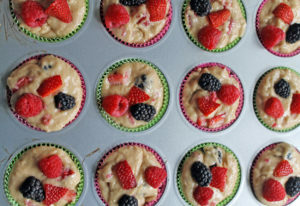 Using the leftover berries, press a few into the tops of each muffin. Bake muffins at 425 degrees for 5 minutes. 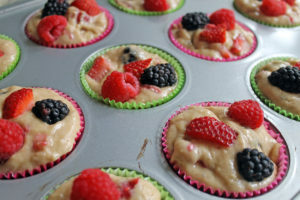 Keeping the muffins in the oven, reduce the temperature to 375 degrees and continue to bake for 20-25 minutes. Tops should be golden brown and a toothpick inserted in the center should come out clean.